Do Probiotics Work In Diverticular Disease Pains ? J Gastrointestin Liver Dis. 2010 Mar;19(1):31-6. 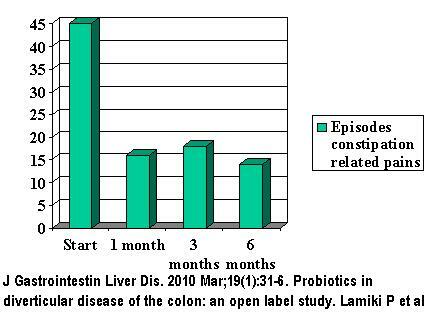 Probiotics in diverticular disease of the colon: an open label study. scored (1) constipation, (2) diarrhoea and (3) abdominal pain.